Without a doubt, the glutes are the most coveted body part for women who are seeking improved shape and aesthetics. It is often said that bikini competitions are won from the rear, but having nice glutes will actually make you look better in jeans, dresses or nothing at all. That said, there is great controversy surrounding the best way to train the glutes for improved development and function. In this article, I intend to set the record straight. Myth #1: The glutes are a fast-twitch muscle that should be trained with heavy weights alone. There are two studies in the literature that have examined the fiber type percentage of the gluteus maximus. One study showed that the gluteus maximus is 68% slow twitch and 32% fast twitch 1, while the other found that it is 52% slow twitch and 48% fast twitch 2. Clearly the gluteus maximus is not primarily a fast twitch muscle, and this indicates that both higher reps and lower reps should be performed when training the glutes. Moreover, newer research, for example, is consistently emerging showing that higher rep bodybuilding-style training is equally as effective as lower rep powerlifting-style training for increasing muscular hypertrophy. Gaining strength is better achieved via heavier, lower rep training, but not muscle growth 3. When attempting to maximize hypertrophy, you want both the type I fibers and the type II fibers to grow to their fullest extent, and research indicates that higher rep training better elicits type I fiber growth than lower rep training while lower rep training better elicits type II fiber growth than higher rep training 4. Therefore, it makes sense to include a variety of rep ranges when training the glutes. Myth #2: Squats are the king of all glute exercises. In 2006, the American Council on Exercise funded the only comprehensive resistance training experiment examining glute electromyography (EMG) activity to date. The report is titled, Glutes to the Max 5, and it showed that a variety of glute exercises highly activate the glutes. 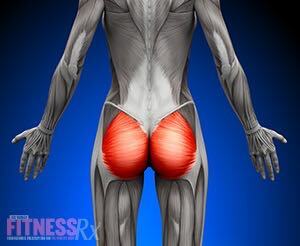 Moreover, the squat did not activate the glutes to the highest degree. I have conducted an extensive amount of EMG research on numerous lifters, and my experiments show the same findings. Squats are a great exercise, but they alone will not maximize glute development. You want to perform other exercises as well, such as hip thrusts, deadlifts and back extensions. Myth #3: The glutes should be trained once per week for optimal development. Many bodybuilders believe that each muscle group should be trained once per week for optimal development. However, these same bodybuilders contradict themselves when attempting to bring up a weak body part. For instance, if they have weak calves, they’ll train their calves several times per week. Many women have incredibly weak glutes, and their glutes therefore require much greater focus in their training. The gluteus maximus is, on average, the largest muscle in the body, and it can handle a lot of volume and frequency. My programs have always involved training the glutes multiple times per week, and you’ll be hard-pressed to find a personal trainer out there who has amassed a more impressive collection of client testimonials, before/after pictures, and glute transformation photos. I recommend training the glutes 3-4 times per week for maximum results. Myth #4: Variety isn’t necessary in glute training; just focus on getting strong at one or two exercises. Research by McAndrew et al. 2006 6, shows that the gluteus maximus contains three anatomical subdivisions that function uniquely. Furthermore, studies show that the upper and lower gluteus maximus activate uniquely during exercise 7,8. Some exercises such as squats and lunges work the lower gluteus maximus well but do not activate the upper gluteus maximus to much extent. Other exercises such as side lying hip abductions work the upper gluteus maximus well but do not activate the lower gluteus maximus to much extent. Moreover, there are three primary mechanisms of muscular hypertrophy: mechanical tension, metabolic stress and muscle damage 9. Some exercises are better suited for producing high levels of tension, some high levels of metabolic stress and some high levels of muscle damage. In addition, it’s worth listening to what the bodybuilders and bikini competitors have to say about the matter. Bodybuilders like Kai Greene train the glutes separately and include specific targeted glute exercises, as does former Ms. Bikini Olympia Nathalia Melo. In fact, Ms. Melo states that Brazilians in general love to perform a wide variety of glute exercises 10, and they’re well known for their impressive derrieres. While it’s important to become well versed and strong at certain compound movements that target the glutes, you’ll get more bang for your buck if you also include glute isolation movements. Myth #5: Getting sore is vital for building the glutes. Many lifters mistakenly assume that if they fail to get sore in their glutes in the days following a training session, then the workout was unproductive and inferior. This could not be further from the truth. If you want to get incredibly sore, you could simply train the glutes infrequently, perform exercises that stretch the glutes under load such as lunges, focus on performing controlled eccentric actions and include unfamiliar movements. Each of these methods will produce soreness. However, soreness isn’t the end-all-be-all with regards to growing muscle 11. Many of my clients who have seen the best results in glute growth never got very sore in the glutes during their transformation process. There’s much more to the glute building equation, which I’ll elaborate upon below. Getting stronger 12 is vital for developing the glutes. If you’re the same strength next year as you are right now, then your glutes probably won’t have changed shape to much degree. However, you can’t get stronger at the expense of using sound technical form. If your knees cave in dramatically during squats, your back rounds dramatically during deadlifts or your back arches dramatically during hip thrusts, then you won’t be working your glutes optimally. Moreover, you could end up hurting yourself, and if this happens, your glute building potential will come to a grinding halt. In order to ensure optimal progress, you need to make sure your form is spot on and that you always feel your glutes working during the various glute exercises. In addition, you should feel a burn in the glutes and attain a glute pump during certain exercises such as hip thrusts and back extensions, as this can enhance the glute building process 13. Hopefully, this article has shed some light on optimal glute training strategies and dispelled some common myths and misconceptions. The best glute training programs focus on getting stronger while adhering to excellent technical form in a variety of exercises and rep ranges. Sirca & Susec-Michieli 1980 | Selective type II fibre muscular atrophy in patients with osteoarthritis of the hip. Johnson et al. 1973 | Data on the distribution of fibre types in thirty-six human muscles. An autopsy study. Schoenfeld et al. 2014 | Effects of different volume-equated resistance training loading strategies on muscular adaptations in well-trained men. Mitchell et al. 2012 | Resistance exercise load does not determine training-mediated hypertrophic gains in young men. McAndrew et al. 2006 | Muscles Within Muscles: Mechanomyographic analysis of muscle segment contractile properties within human gluteus maximus. Lyons et al. 1983 | Timing and relative intensity of hip extensor and abductor muscle action during level and stair ambulation. An EMG study. Fujisawa et al. 2014 | Hip muscle activity during isometric contraction of hip abduction. Schoenfeld et al. 2010 | The mechanisms of muscle hypertrophy and their application to resistance training. Bret Contreras | Brazilians Know Booty Best: An interview with Nathalia Melo Ms. Bikini Olympia Champion. Schoenfeld & Contreras 2013 | Is postexercise muscle soreness a valid indicator of muscular adaptations. Bret Contreras | Progressive overload. Schoenfeld & Contreras 2013 | The Muscle Pump: Potential mechanisms and applications for enhancing hypertrophic adaptations.